This new home in located in Manuel Antonio and is the start of a new development that is to be a big hit with home buyers and investors. The development includes: Amazing View Home Sites Gated and guarded community Community Spa and Tennis Club Nature Preserve Minutes to world renowned beaches Walk to shopping and fine dining Hike and Bike Trails Office to help coordinate activities Active rental pool Maid and maintenance service available Abundant wildlife Watch the monkeys play, while gazing off your hilltop balcony. Spend your evenings listening to the exotic birds, and watch as the sun drifts away into the horizon over the ocean. 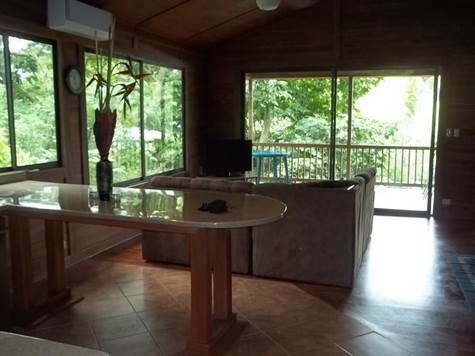 The Casas at Manuel Antonio truly is Paradise. This brand new home is the first of 28 to be built in this unique development. The home has all the modern upgrades and comes fully furnished and ready to move into or rent. It has 2 bedrooms and 2.5bathrooms, and laundry room. Located in a hillside with gorgeous jungle views. Contact us today to see about purchasing this home or have one like it built to your specifications.